If there is one thing I know about Fall it's that it's a great time to get out and about! 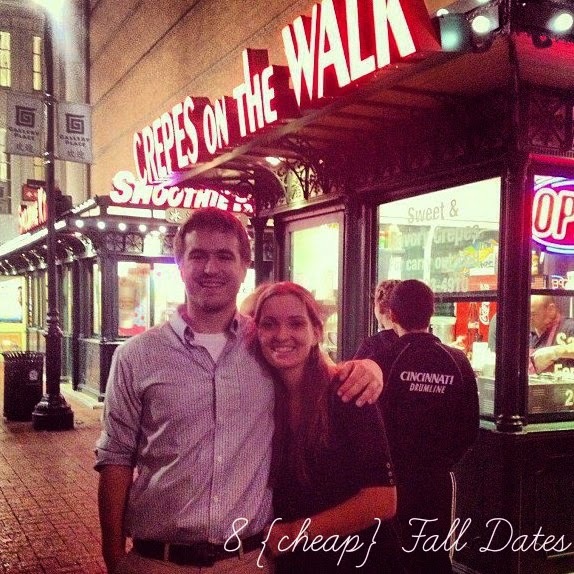 Here are eight free (or almost free) dates that I want to try this season. A couple of months ago we happened upon this great murder mystery program on the radio. It was corny and quirky but ended up being a lot of fun. Normally we love binge watching Netflix so this was a fun and different way to enjoy a story (definitely didn't realize how not accustomed I am to listening- and not also watching- something). So find a fun program or podcast and download it to your phone. I HIGHLY recommend Serial. Make dinner, get comfy, use candles instead of lights, and listen up! Luke loves tennis and while I'm fiiiine for your average never-plays-tennis-player, I'm a truly rotten student. So our tennis dates always start out as lessons and end in me making completely correctable mistakes because I won't pay attention for more than a few minutes. That being said it's always fun to get out and move a little... plus a fenced in, flat area + a ball = doggie heaven so we let Mabel third wheel it. I would guess that just about everyone has a couple of house/ apartment projects in the back of their minds at all times. Dedicate one night to checking one thing off your list! It might be printing and framing a picture that you love or making a birdhouse. You can also give yourselves five minutes on Pinterest and pick one fun and easy craft to tackle together. Whatever the project, set a time limit, go shopping, and hunker down. I know that we'll be working on holiday decor and Christmas gifts this Fall! Some people make camping out to be a really intense, outdoorsy, big adventure, which we think is funny because our time camping consists primarily of eating and sitting with a little walking and hiking on the side. We splurge on some favorite snacks, make a few meals in advance (like these tin foil dinners) and head out. There's nothing better than waking up outdoors on a crisp fall morning, making a fire and eating leftover s'mores for breakfast. If you don't have camping gear check local list serves or craigslist for loaners. (Alternative: camp out in the living room! Make a fort and cook s'mores over the stove). Game night normally means board games at our house so I really like the idea of switching it up and incorporating a few other games. Pick one board game, one computer game and one video game. Keep a running total throughout the night and get competitive! (Or don't if your husband is like mine and wins 95% of the games that you play). Sporcle isn't your typical computer game but we could play for hours on end. The one Fall essential that trumps the rest is enjoying the leaves as they change colors. I'm excited to make a batch of crock-pot cider (good recipes are welcome! ), throw it in a thermos, and take a scenic drive this season. Virginia isn't known for its mountains but it IS known for all the foliage so it's easy to enjoy the color change in just about any direction. As my wise mother points out, the zoo is better when you don't go in the summer. We live close to the National Zoo and love visiting in the Fall when the animals are more active and we don't have to push past as many tourists to see the panda cubs up close. Some zoos even have events like "Boo at the Zoo". Pack a picnic and make an afternoon of it! I'm terrible at keeping a diary or journal. Every now and then I start it up and it lasts... one night. About a year ago I decided to start a google doc to record important family memories. I have a section for the year, bullets for each month and then include a picture for each event. Ours is very general; we only record big events to keep it manageable. We love being able to look back at the google doc every couple of months (mostly to see how little Mabel was when we got her). You can do something more formal, like create a shutterfly book, or just keep it to a word document with a photo, a date and a few details.